An apple a day keeps you healthy, but a regular sight of custom 1.875 x 2.215 small apple shape full color magnet from over a refrigerator door makes a student conscious. 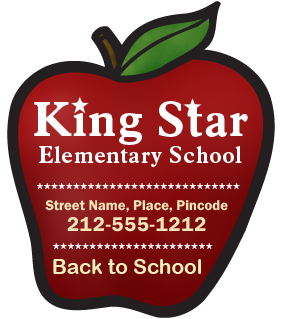 This promotional 1.875 x 2.125 custom small apple shape full color magnet can be favored for fundraisers or for spreading brand awareness amongst parents and students in new academic year. A personalized 1.875 x 2.215 small apple shape full color magnet will be retained as a pride in homes by parents and it will start influencing students with its affectionate shape! This magnet can be employed for promotions by grammar schools, play schools, daycare and schools for students with special needs. Product Size : 1.875 in. x 2.125 in.